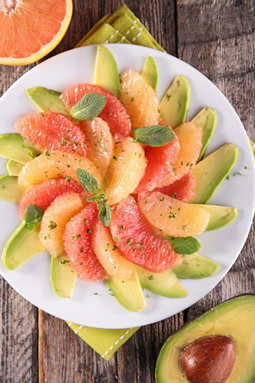 Avocado and Grapefruit Salad - A recipe from Savor California, the online showcase for extraordinary gourmet foods and beverages from California. Add the fresh mint, shallot, salt and pepper and mix well. Taste and re-season accordingly. Arrange the avocado slices and grapefruit segments on a serving platter. Drizzle with the dressing, and garnish with a mint leaf. Note: If serving on a bed of mixed greens, toss greens with dressing before topping with avocado and grapefruit slices.